Long before Senator Elizabeth Warren made it a word blazoned across t-shirts, Karen Sessions persisted. At the start of her career, the path to her current position as head of Bank of America Business Capital (BABC) and Asset-Based Lending was not clear-cut. But once she realized finance was her future, she overcame many obstacles by sheer doggedness. “It took a lot of persistence to even get my foot in the door,” says Sessions, who majored in geology at Cornell University but quickly realized that she didn’t want to be an environmental consultant. She returned to school and studied finance at the University of Indiana. After graduation, someone told Sessions that Fleet Bank had an opening, and the newly minted MBA was eager to pursue it. “I called, and no one called me back. I called again, and no one called me back. I tried at 5 o’clock. I tried at 7 a.m.,” Sessions recalls. “I don’t remember how many times I called, but any softer soul might have given up. But I was like, ‘what’s the downside? I don’t get the job?’ So I might as well try. She looks back fondly on her time at Fleet as she does for every position that led to her current post. Sessions spent five years at Fleet, working up from associate to vice president of Securities in its Capital Markets Group. ”It was an incredibly engaged group of people who were working hard to build a business. And it was a really fun time to be part of that group. And that’s where I learned about capital markets, and I really learned how to set the foundation for hard work in an office setting,” she says. Sessions became part of the bank syndications group at Fleet, where she ultimately built her career. That good time came to an end when Session’s husband, a university professor, was offered a faculty position in California. Like many women before and since, she chose to leave her job and follow him west. It was not a decision she came to regret. At Union, Sessions helped the bank modify some of its risk policies, set up an internal book and build an asset-based division that is successful to this day because of seeds she planted. After a year and a half, she left Union for Wells Fargo’s retail division, another asset-based opportunity. A brief move to Wachovia offered a different type of experience. Then the mortgage crisis hit Wachovia, and the bank went into a tailspin. Everything shifted. Wells acquired Wachovia, and Sessions was back at her old shop. Sessions spent a total of nine years at Wells in different roles before moving to Bank of America almost five years ago — nearly a full circle since Bank of America absorbed Fleet just after Sessions moved to California. “It’s been an incredible experience,” she says of her current gig. In our current cultural environment, it seems as if men and women are at opposite ends of the barricades, but Sessions is open about the quality of life choices she has made in her career — choices men usually don’t have to make — and she credits the men who worked with her for supporting her and appreciating what she brings to the table. Her choice to move to Wachovia was also partly a quality of life decision. These decisions have made her determined to create an employee culture at Bank of America that reflects the lifestyles of the people who work there. “People are working really hard in this organization every day, not only working long hours but being responsible. We’re trying to help them have a great career at Bank of America. We want to have conversations about what people’s objectives are. Whether it’s, like I did, prioritizing quality of life right now. Because I have those priorities doesn’t mean I’m not a good employee and that I’m not going to be a great long-term employee. We just need to find ways to help people have career fulfillment here at the bank,” she says. Sessions is also proud of Bank of America’s diversity and inclusion program. 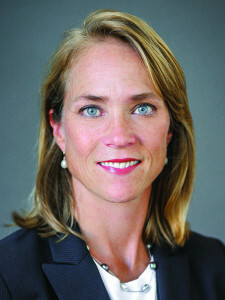 She credits her predecessor at Bank of America, Jeff McLane, with supporting her in the new position. As she takes on a larger role at the bank, Sessions says her main goal is “to deliver for our clients. That’s a broader bank goal but it’s so fundamental. Just deliver for your clients. At Bank of America and BABC, that’s what we believe. Our retail finance group, together with our asset-based lending businesses, is going to maintain market leadership and will produce strong results so we can focus on our clients. These are turbulent times, but even over the phone, Sessions exudes optimism and an upbeat attitude.